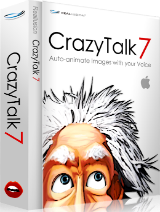 CrazyTalk7 is the world’s most popular facial animation tool that uses voices and text to vividly animate facial images. Discover the magic of creating dynamic, talking characters from static images that whisper, shout, talk and sing with hilarious motions that emulate your own voice energy. With this groundbreaking Auto Motion technology, you just need to import images, specify the facial feature points and record your own voice, as it automatically generates lip-syncs to create 3D life-like, talking videos. Use hundreds of auto motion templates found in the content-rich asset library, or use powerful facial puppeteering tools to create professional animations with no prior experience.